2017 has been another interesting year for the LATA Foundation team – We continue to be be inspired by the amazing work of the grassroots projects we support. Konojel, the women’s co-operative restaurant project we supported in San Marcos on Lake Atitlan, has become self-sufficient, and the subsequent English lessons have been well received. The children and young people in Quito helped through education by Condor Trust continue to thrive with six completing secondary school last summer while those in tertiary education include a physiotherapy student, an ophthalmology student and a medical student. 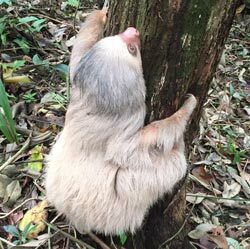 In Costa Rica several rehabilitated sloths are being prepared to be released back into the wild with tracking devices to monitor their progress, and in Nicaragua the El Caracol community are beginning to benefit from the sale of the dragon fruit and pineapple crops planted. Several of our projects have also faced challenging times this year through weather events, or changes in funding, conditions or staff which has made our support even more important. Through your generosity we are proud to be able to offer our support to these great projects. 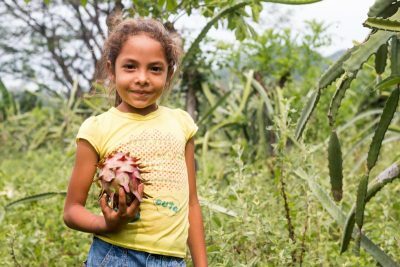 A new, sweeter and more marketable type of pineapple has been grown in Nicaragua by local communities supported by our partner, Nuevas Esperanzas. The Golden pineapple will be on sale soon as the the next stage involves the communities working collaboratively to create a register of their production, establish a collection centre and road-side kiosks and outlets from which to sell their produce. The LATA Foundation have been supporting Nuevas Esperanzas’ Agroecology program by funding training for farmers from five local communities in the Telica-Rota area, near Leon in Nicaragua. These include practical lessons given by agricultural and beekeeping specialists and lessons in business management and commercialisation of new products. This follows on from previous years’ success in funding the planting and growing of a new range of crops such as pineapples and dragon fruit on the model farms that were established in 2015. Over the past few months we have received some fantastic news regarding some of our projects who have completed their objectives with wonderful reports. A new community centre has been built in northern Argentina, a Tilapia breeding program is well under way and the rehabilitation of the squirrel monkeys has proved to be challenging but ultimately a great success. Together with the construction of temporary homes in Ecuador for the Emergency Relief campaign, we’re thrilled to be able to allocate our funds to such worth causes. The latest news from KSTR (a wildlife rescue and rehabilitation centre in Manuel Antonio, Costa Rica) is that our 2016-17 project is going well. We purchased sloth collars to monitor the animals once they have been released into the wild which allows the scientists at KSTR to track the sloths, check on their well being and gather valuable data that will help other wildlife release projects around the world. The two-toed sloth Beyonce is the next to be released and her enclosure has been opened so she can go into the wild whenever she wants. Depending on her progress, sloths Bruno and Elvis may also be released soon. Kiwi is a three-toed sloth who is in the ‘bootcamp’ phase, trying out her collar and being prepared for release. Our 2017-2018 project for KSTR will focus on reforestation. On 8 June for World Environment Day KSTR planted 800 trees which contributed to the month’s goal of planting 1,000. A 117-hectare property was donated to them, so they are planting up to 94,000 trees in total to reforest the area and also to provide food for the wildlife. Having helped provide cooking equipment and restaurant furniture for the Sabor del Sol Cafe in 2016, we were delighted that the cafe was a success, not only providing the ladies from the Konojel Community Center with an income but also with profits that helped fund Konojel´s daily nutrition programme. In 2017 they wanted to work out whether it was economically sustainable for them to open for extra evening shifts, so we funded a pilot scheme for two months, covering the cost of the additional labour and ingredients. The results were positive, both increasing profits and creating two extra jobs. 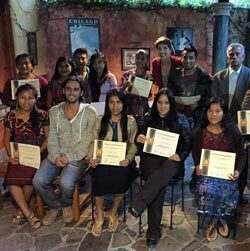 With its location in the town of San Marcos de La Laguna, which is a popular destination for tourists visiting Lake Atitlan, Konojel decided to run an English course which would benefit those in the community who come into contact with tourists and hopefully increase employability. We are thrilled that 17 students gained diplomas after completing the 6-month course and wish them well in finding jobs when the high tourism season begins in December. 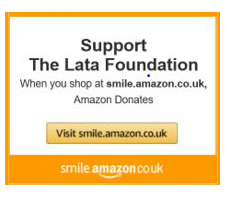 We’d like to extend huge thanks to LATA member Journey Latin America for setting up The LATA Foundation as their nominated charity, directing the optional per-client charity donation to the LATA Foundation. This has helped our organisation grow to a new level. We are able to forecast more accurately and efficiently the allocation of our funds to our amazing existing projects as well as increase the scope of where else we can help. We held another fantastic Women in Travel event back in July, this time at Mestizo Restaurant & Tequila Bar. The event was a great success and raised an amazing £2,676! The money is already helping projects across Latin America, including students in Quito, Ecuador to allow them to reach higher education. These children from deprived backgrounds would have otherwise left the system early. Our funds allow the provision of uniform, books and school materials to enable children from low or no income families to attend secondary school in the city, with the ultimate aim of helping them complete their education, find a job and break the cycle of poverty. Find out more about Condor Trust. We are delighted to welcome Chris Pickard as our new Chairman of the LATA Foundation who has been a trustee of the Foundation since its inception in 2007. Chris served on the Executive Committee of the Latin American Travel Association (LATA) for 14 years and was deputy chairman for nine of those years, before becoming chairman of LATA in July 2012. He served two terms as chair, before standing down in June 2014. Chris has recently returned to the UK having spent the last two years as director of tourism for the island of St Helena in the South Atlantic, the only destination, due to its location, to be a member of both LATA and its African counterpart, ATTA. Chris lived and worked in Brazil for over 20 years and established and ran the Brazilian government’s first overseas Tourist Office in London. 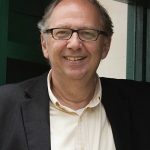 He has worked professionally in journalism, media and marketing since 1974, writing extensively about all aspects of Brazil and South America. An ex-director of communications for the World Travel & Tourism Council, he now runs Critical Divide, a marketing and PR consultancy that specialises in tourism, the arts and Latin America. The clocks have gone back and the nights are drawing in, so all thoughts turn to Christmas! 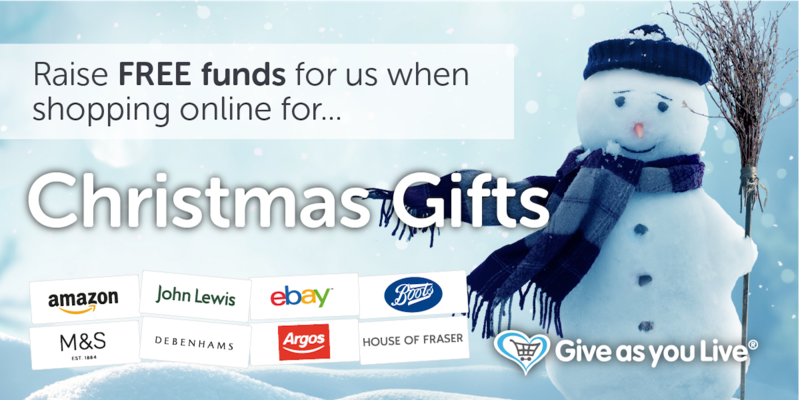 Buy your gifts online via the ‘Give as you Live’ website and a portion of your spend will be donated to the LATA Foundation, without costing you an extra penny! Shop Now! ← 12th July 2017 Women in Travel Networking Evening!